It is the time of the year that everyone at home gets ready for, the Christmas long and heavy lunch and dinner, and the leftovers until the end of the year. 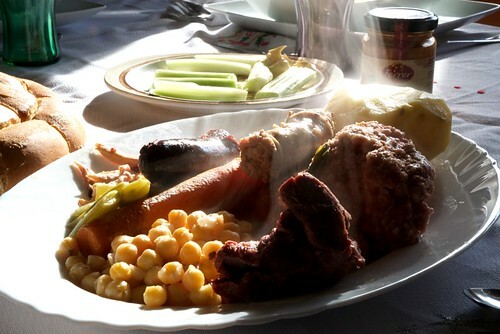 The Christmas menu in Catalonia differs from family to family but most of them prepare similar catalan traditional food. 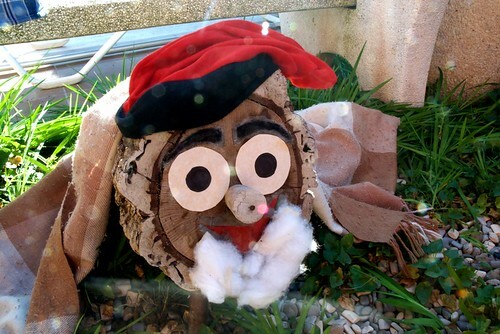 All over the world, kids are waiting for Santa to give them presents, but in Catalonia and some places of the neighbouring regions Andorra or Aragon we still keep our own magic character to bring us presents, the Tió. I never realised how hard it was to explain my home country Christmas traditions until I had to write a report for japanese school in Tokyo. Keep reading to know more about the catalan Christmas food and traditions, and feel free to leave a comment if you know any other original or weird Christmas tradition around the World. Fer cagar el tió, weirdest catalan Christmas traiditon. The nativity scene is a popular tradition in most of the homes in Spain. In Catalonia, though, we have a special figure to place with the rest of the scene, the caganer. This figure represents a man, squatting and defecating. Just like that. With all the figures representing Christmas, we catalonians have a man minding his own business. It’s so popular you can buy your favourite celebrity figure representing the caganer in a squatting pose. Even College Humor has made a video about it! You can watch in this Youtube video. 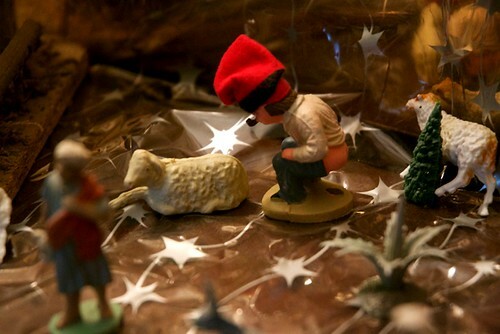 The Caganer, most popular catalan figure for Christmas in the nativity scene. The explanation of this catalan Christmas tradition brought me a hard time first time I tried to tell to my international friends. Basically, the Tió is a log. With a smile face painted on it. 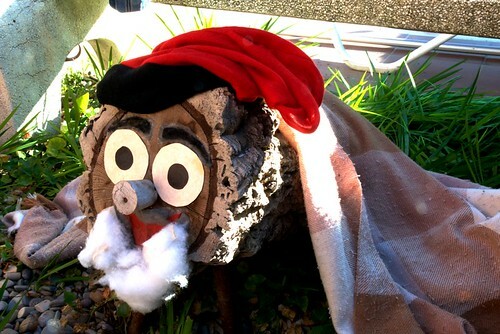 At the beginning of December the Tió arrives to our homes. The kids will feed the Tió and cover it with a blanket to keep it warm until Christmas eve. Then the magic of the tradition starts. Kids in the house take sticks and beat the Tió to a pulp until it shits presents, while singing, laughing and the parents take thousand photos of the magical moment and happy kids with their presents. Nowadays its a direct competitor of Santa Claus as a bringer of presents, but many years ago it only shat candy and small presents. Every recipe varies from family to family, and every home has its own special catalan Christmas plates, but most of them are in every family, like Escudella i can d’olla (Christmas soup). A strong flavoured soup made with vegetables and huge meat balls among other types of meat, served on a dish with galets, a type of pasta. 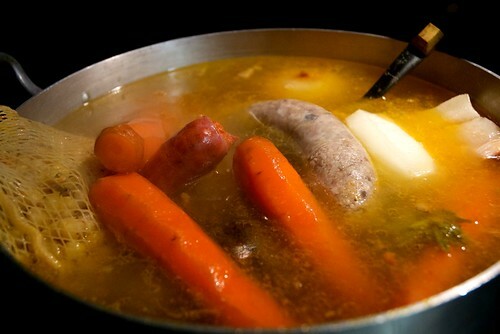 Escudella amb carn d’olla, catalan Christmas soup. 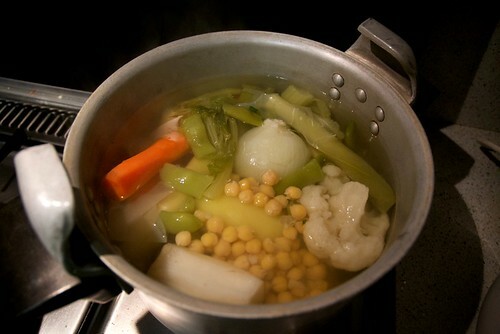 Vegetarian version of Escudella, Christmas catalan soup. Ingredients of the Escudella, catalan Christmas soup. 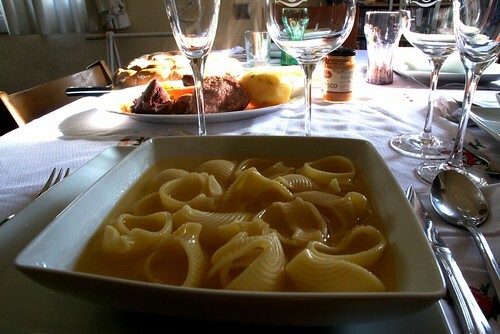 Galets, the pasta for Escudella. Not really a Christmas traditional food, but harvest of calçots starts in winter season and many shops and restaurants have it already before Christmas. In my family calçots became a traditional Christmas appetizer before the real deal on the table. 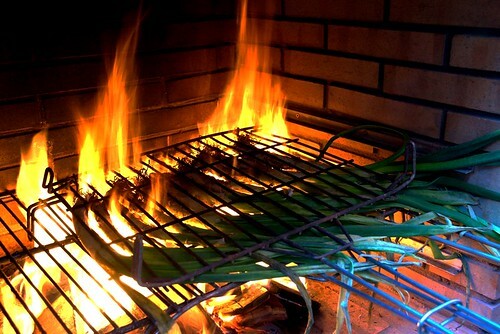 Calçots, the most loved vegetable for catalans. 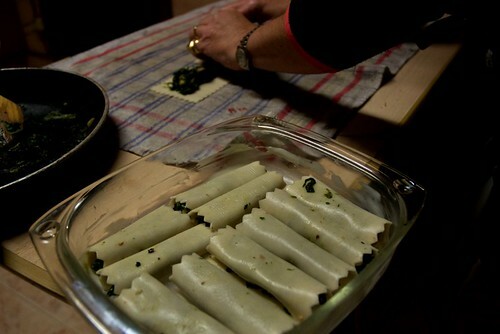 Every year at home, my parents prepare this canelons, traditional catalan version of the italian cannelloni. Much softer than the italian, filled with minced meat and covered with milk cream and cheese. 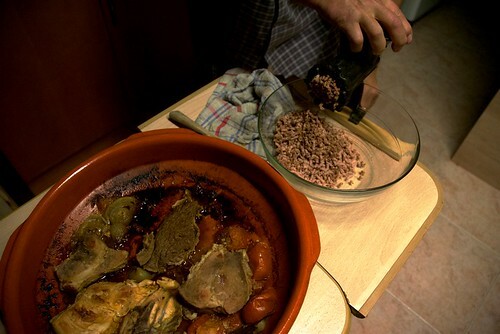 Minced meat for Canalons, catalan Christmas meal. 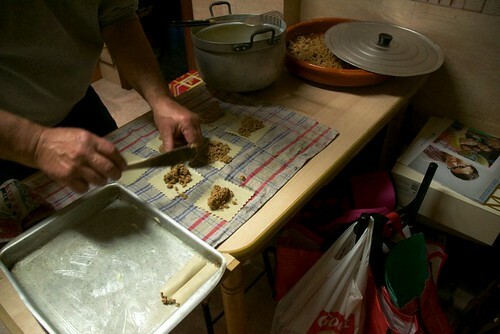 Preparing homemade canalons, catalan Christmas meal. Vegetarian version of canalons mades with spinach, catalan Christmas meal. 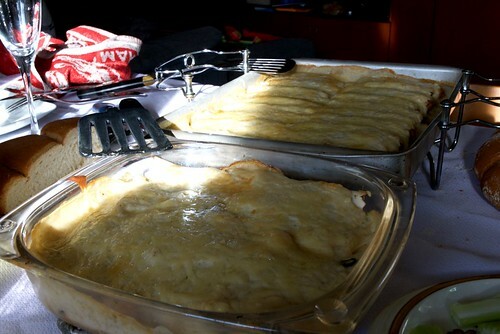 Homemade canalons, catalan Christmas meal. 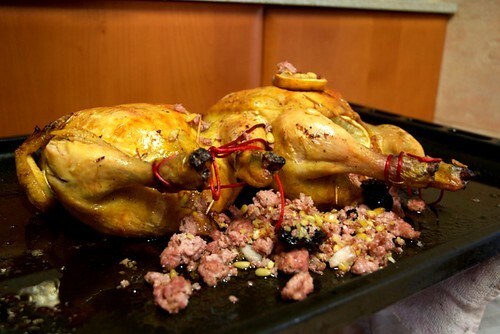 In many catalan families, Christmas chicken is one of the main dishes of the day. At this point, after finished the Escudella my stomach starts to feel like the chicken. Stuffed with so much food I could explode. Christmas chicken, stuffed with minced meat and plums. As for desserts, and if you succeeded eating the whole Christmas menu there’s a lot of sweets awaiting. Turrons, neules, and the popular Tronc de Nadal. 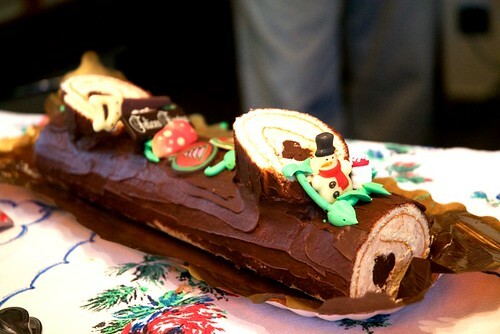 Christmas dessert prepared with chocolate and butter with the shape of a log, popular in many places around Europe and originally from France, Bûche de Noël. Tronc de nadal, popular Christmas dessert.